As more women continue to assume executive and senior level positions in the financial technology industry, they bring new traits and fresh perspectives to the industry and business. But even then, female achievement of leadership roles still lags behind male counterparts. 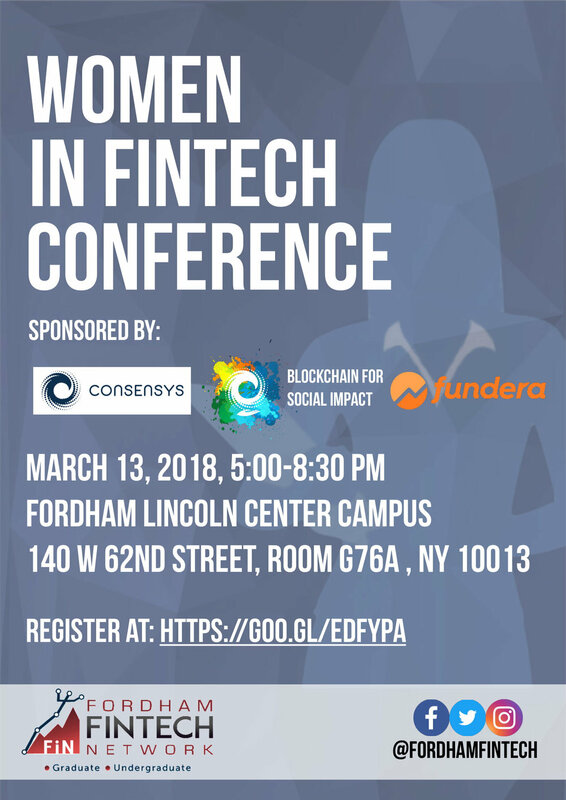 To celebrate Women’s History Month this March, the Fordham FinTech Network, in partnership with ConsenSys, Blockchain for Social Impact Coalition and Fundera, present our first annual Women in FinTech Conference on March 13, 2018 from 5:00 to 8:30 PM at Fordham University Lincoln Center (140 W 62nd St. Room G76A; New York, NY 10013). Our event intends to highlight women in the industry, provide trends and insight in FinTech, and give advice to women who are seeking careers in the business. We encourage everyone to attend as this is an all-inclusive event open to all. It is not an effort to exclude men, but to include women. The ConsenSys “hub” coordinates, incubates, accelerates and spawns “spoke” ventures through development, resource sharing, acquisitions, investments and the formation of joint ventures. These spokes benefit from foundational components built by ConsenSys that enable new services and business models to be built on the blockchain. In addition to the development of internal projects and consulting work, ConsenSys is interested in the identification, development and acquisition of talent and projects on an ongoing basis. Blockchain for Social Impact Coalition (BSIC) incubates, develops, and implements confederated blockchain products and solutions that can address social and environmental challenges across the United Nation's Sustainable Development Goals. The Blockchain for Social Impact Coalition is an initiative of ConsenSys, a venture production studio based in Brooklyn, NY. Small business lending is broken—and Fundera is here to fix it. By building the most trusted marketplace in the industry, we make lenders compete for business instead of the other way around. Small business is the backbone of our economy, and business owners deserve a partner they can trust—especially when it comes to financing. 4 out of 5 business owners get denied by banks for the loans they need to solve problems and seize opportunities, and far too many get ripped off by unregulated brokers looking for a quick buck. With Fundera, business owners can get competing offers from dozens of the country’s leading small business lenders by submitting just one application. Fundera's service is simple, transparent, and best of all? It’s absolutely free. Fundera's mission: to put the power to borrow back in the hands of business owners.